It sells to 100 cents, but Max still has different credibility. It is not expensive, so I always use it instead of the average. This review is about item#10105042. 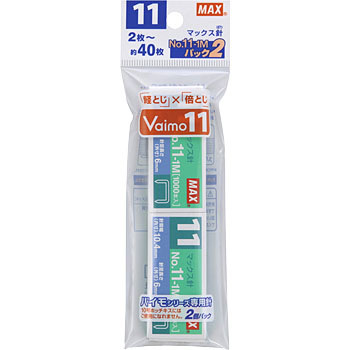 I recently scooped a small stapler called Vaimo 11, but I did not have a special needle, so I purchased 40 sheets of paper with a light force and I am very satisfied. I think it can be used easily by women. This review is about item#76149333. It was pretty good with making a very solid firm · · ·. I purchase it when free shipping is not enough. Of course there is nothing wrong with the product as well. Compared to No. 10, the fixing power is dramatically increased, so it is very easy to use, such as when there are many sheets. This review is about item#76149324. It is easy to calmly comfortably. It will be appreciated that it will arrive soon. "Bimo" has a product with a No. 1 needle 1 box and a product without a needle. Currently it seems like you can buy cheaply to buy a needle free item + two needles 2 separately. There is nothing without trouble in the usual use of the product until now. Close the large number of copy sheets. If it says in a word it is amazing! It is such a wonderful product that I think that Hotchkis up to now was a great product, the price of 1000 yen chot with this quality is absolutely recommended. Once you use it you can not use the staple until now. I bought it somewhat cheaper than home center etc. Since it is a maker item, there is no problem at all.